Fabio Ricci (Scotty), an Italian psytrance producer, is the mastermind behind the project Parasect. His music can be described as a constantly evolving psychedelic bouncy sound with an unmistakable Parasect's touch. He tries to draw influences from many electronic music genres, to bring, as much innovations as he can. Although he has been producing for just a short while, Parasect is now a well estabilished artist in the worldwide psychedelic trance sceen, playing every week end all around the world. He is going to release his fourth EP, FUTURA, on 25th of February with BomShankaMusic. It will be, as always, completely different from the last and it will brings a new school concept, a modern and futuristic psychedelic trance music. The musical project of MileSound BASS was born in 2002 in Pioltello (MI). At the beginning, it consisted only in beat production, but after the first creations he felt the need to move away from the classic rap. After two lucky months in London MileSound BASS found himself catapulted in the world of electronic music and from that moment he started to explore it. Versatility, creativity and eclecticism are the driving forces of his project, together with the unusual passion for extra-terrestrial life and lucid dreams: the idea of the project is to mix genres and styles always different, to make synthesizers, drum machines and software work together to create an "alien" music, speaking of the dream world and life beyond this world. dmk.VIII is a liquid sounding electronic music project. Deep and soft synthesis to brings the audience in touch with very peaceful feelings. Behind this name there is Ariberto, a multilateral artist, also author of Psylosopher and Visiønary solo projects and co-author of GabAriAn project, by side with G-On. He is the founder of CVR & Art:Network. ERNYA is a psytrance project officially born in Milan during 2017 as the result of an experience ad a rock dj behind the pseudonim of BJORNE. The growth and the inspiration take a leap with the starting of a strict collaborarion with Creative Visions Records. A musical trip inside the obscure and raw underground, evolving between deep and aggressive sonorities, sometimes even with playful tunes and twilight tints. Ernya's dj set is based on an explosive and constant energy that can completely change between daily and nightly events. In his playlists, moreover, there's mostly all of the tracks made by C.V.R. producers, as he coordinates C.V.R. 's psytrance sector. Deep space, visionarian scapes, alien worlds. Records of music transmissions from the GabAriAn system. This is the duo live project by Ariberto (dMk.VIII / Visiønary) and G-On. The channel is newborn and we need your help to share these alien music records. Support and follow us, outer world brothers . Matteo Spadaro is born in 1991, Milano. Being attracted since a young age from the concept of synesthesia and synthesis of the arts, begins his journey trough creativity by playing guitar and then singing in a metal band, but soon discovers that his interest in arts goes far beyond practicing an instrument. Studying to get a degree in computer science applied to music (2011-2014) brings him to critically compare music with other means of expression such as video art or pictorial art and in 2013 starts writing short stories and drawing using the pseudonym of H3ml0ck: a name that refers to the intent of learning trough self-teaching, the freedom to do it without rules and the aim of continuously growing trough a constructive comparison with others. After researching Kandinsky’s theories, he finds his own way to translate paintings into sounds by using Matlab coding and MIDI. These works flowed together with the illustrations (and stories) produced between 2014 and 2016 to make “Eight Times Round”: a still-unpublished interactive eBook with an original story in the ePub3 standard. In 2016 meets Ariberto de Arruda and joins Creative Visions Records & Art:Network as vice-director and graphic designer starting practicing digital art and producing various artworks and graphics for flyers and cd’s. In 2017 H3ml0ck begins his career in visual art actively collaborating with various collectives (Synthetic specter, intersezioni, Ekate, PlazaLabStudio, teeth breakers, RMS, Macao, f.o.a. Boccaccio, Old Family Crew, The move) and sets up two recurrent events: "Drunk of ink" and "Visionbox". Visiønary is a dystopic world, bringing raw industrial sounds to the dancefloor. Modular, overdrive effects and deep spectral atmospheres are core elements in the sound design of this project, aiming a total immersion of the listener in this massive dark scenario. Author of the project is Ariberto, founder and label manager of CVR and author also of Psylosopher and dMk.VIII projects.
" 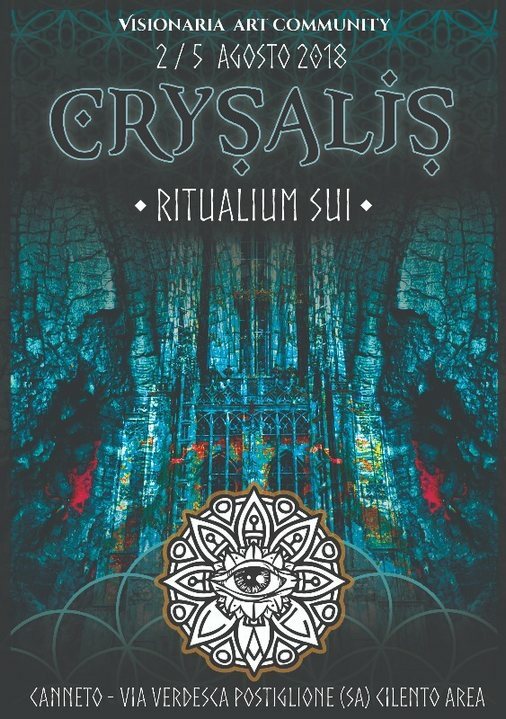 From sacred ruins in ancient woods to unknown rests in the depth of hidden seas, the Psylosopher creates alien worlds and dimensions made of crystals and energy. Sound, the vibrational voice of God. The Psylosopher crafts it into psychedelia to tell you stories made of deep basses and spectral atmospheres, liquid leads and melting grooves. Behind this name there is Ariberto, a multilateral artist, also author of Psylosopher and Visiønary solo projects and co-author of GabAriAn project, by side with G-On. He is the founder and manager of CVR & Art:Network and resident artist at Macao - New Center for Arts, Research and Culture, in Milano." Lili Refrain è una chitarrista, compositrice e performer romana. Dal 2007 ha un progetto solista in cui suona chitarra elettrica, voce e loop in tempo reale senza alcun ausilio di computer o tracce pre-registrate. I suoi brani scaturiscono dall'orchestrazione delle innumerevoli sovrapposizioni che crea dal vivo, mescolando l'ambient minimalista a psichedelia, folk, blues, metal, opera lirica e virtuosismi chitarristici. La sua padronanza tecnica e il suo raffinato gusto compositivo sorprenderanno l'ascoltatore immerso nella suggestiva atmosfera di un'intera orchestra oltre i confini di qualsivoglia genere musicale. Negli ultimi anni ha suonato incessantemente in tutta Italia e in Europa. Ha realizzato tre album che vantano eccellenti critiche da parte di riviste del settore e webzine nazionali ed internazionali: "Lili Refrain" autoproduzione del 2007 ; "9" uscito nel 2010 con Trips Und Träume/Three Legged Cat; "KAWAX", uscito in CD e vinile per SUBSOUND RECORDS e SANGUE DISCHI. LVTVM…fango, argilla, creta in latino. Un brodo primordiale sempre in movimento, in trasformazione, una continua ricerca e metamorfosi della coscienza. Direttamente dai boschi del Monte Amiata una band che unisce tecnica e sperimentazione, ricerca e visione. Due bassi, batteria e synth. Le loro composizioni strumentali hanno una solida base post-metal e stoner ma non disdegnano aperture ambient, esplorazioni psichedeliche, divagazioni jazz. Suoni dal deserto, sabbia al tramonto, atmosfere calde al limite della sopportazione, aria lisergica e distorte allucinazioni. I Tuna de Tierra partono per un viaggio che non ha meta, né fine, ma solo l'intenzione di muoversi all'infinito. Band formatasi a Napoli nei primi mesi del 2013 dal connubio, ormai di vecchia data, tra Alessio De Cicco (chitarra e voce) e Luciano Mirra (basso) che, grazie alla collaborazione di Jonathan Maurano (alla batteria), porta alla registrazione del primo EP, totalmente autoprodotto. "EPisode I: Pilot", pubblicato a Giugno del 2015, è il risultato di ricerche sonore in continua evoluzione e, grazie ad esso, la band raccoglie numerosi consensi, tra cui recensioni da varie riviste internazionali specializzate e l'inserimento in compilation di tutto rispetto. Con l'ingresso di Marco Mancaniello alla batteria, sul finire del 2015, la ricerca sonora della band può finalmente proseguire. Nel 2016 la band partecipa ad alcuni concerti e festival, tra cui lo Sputnik Festival, il King of Stoned Fest in apertura ai veronesi Kayleth e il Pietrasonica Fest, calcando lo stesso palco di band come Carnaval, Sunset in the 12th House, Blaak Heat. Nei primi mesi del 2017 la band torna in studio per le sessioni di registrazione del primo album full-lenght intitolato “Tuna de Tierra”, pubblicato il 22 settembre da Argonauta Records. Sul finire del 2017, Mattia Santangelo (ex La Polvere di Bodélé) si unisce alla band come nuovo batterista, sostituendo Mancaniello. Al momento sono impegnati nel portare in giro il loro lavoro in un tour in aggiornamento, che li ha portati in tappe quali Parigi, Strasburgo, Milano e lo Stones from the Hill festival. "When there's a severe winter and people are going through difficult times due to lack of heat or food, this is Otehi. When someone we love is sick or dies, this is Otehi. When epidemics strike us, when people die, when there is no more hope, this is Otehi." Cit. Otehi is not only an ancient Lakota word, it's a brotherhood, a way to conceive the world. In the early 2011, Maciej Wild Mikolajczyk (Bass & Voice), Domenico Canino (Guitar, FXs & Voice) and Vito Zito (Drums) gave birth to a band and started to work on their own sound, dirty and granitic, sometimes clean and amniotic, a mix of stoner rock, alternative and harcore punk. In the same year, the band wrote his first EP, "Noisy Spirit", which was recorded in the Itria Valley,IT, in a country house in August. It was a very low budget production, recorded with old cheap amps and one 4-channels mixer, but few months ago the album was shared worldwide, and was acclamated to one of the most heavy, trippy and experimental indipendent productions of 2011. In the meantime the band played a lot of live shows all over the Italy and Europe, and there was a change of line-up, Vito Zito abandoned the project for personal reasons, and Corrado Battistoni became the new drummer. During the live rituals, Otehi projects video-art and concept videos about nature, sprits and universe, and all the artworks, posters and graphics are usually made by the band himself, every member of the band have his own artistical research in the graphic arts. In 2013 was released another experimental EP, "Rise Of The Elements". After two years of hard work on music and visual aspects, in 2014, Otehi recorded in Rome their first LP, "Dead Chants and Forbidden Melodies", a concept album where the sound evolved, became more personal and psichedelic, but in the same time heavy,raw and out of control. The Core...Ossia il cuore, il centro, il nucleo o più semplicemente “il core”, così come loro stessi giocano sulla pronuncia del loro moniker per individuare l’origine della loro musica, propongono un sound difficile se non addirittura impossibile da identificare in un determinato genere musicale. In venti minuti di live viene proposta una musica ricca di contaminazioni provenienti da qualsiasi area e sottogenere della musica rock e non solo: hard rock, post- grunge, blues, spingendosi fino ai più tecnici confini della musica progressive, nella quale il loro sound è accomunabile a lavori di pregevole fattura, quali "In Absentia" (Porcupine Tree) e "The Construction Of Light" (King Crimson). "Il Fulcro" consiste nell'unione di quattro amici dediti prevalentemente all'improvvisazione strumentale ma non solo. Direttamente nata dall'esperienza di strada, è musica dal carattere tribale, psichedelica energica, che eleva il ritmo primitivo, la danza e l'interazione sinergica con lo spettatore ad elementi fondamentali. Prendendo spunto dalla scena psichedelica, dalla Goa-Trance, dal Krautrock, dal minimalismo, dal funky, dalla musica sperimentale e avanguardista, il progetto tenta di creare un sound che non è altro che l'insieme delle varie influenze di ognuno dei membri, e che si esplica, molto spesso, in un torrente sonoro che è flusso di in-coscienza collettivo. Qui prende vita un immaginario dada-surreale popolato da euforici indiani metropolitani, gnomi, creature grottesche, mandorle mistiche, raggi solari, dalla penombra deforme e da bambini ampolla. Per quanto riguarda tutto il resto, nasce da un'esigenza di collage personale, tra caos, primitivismo e contemporaneità. Piani sonori esoterici si fondono con ritmiche tribali ancestrali che evocano scene di riti perduti nel tempo. Ipnoteka propone un progetto musicale che crea atmosfere tribali trance con strumenti moderni e ancestrali ed innesti di musica elettronica. Vj Luper (Nicola Pavone) e’ artigiano video, animatore 3D, Vj e programmatore. Si occupa di Videomapping Architetturale, Stage Design e Interactive Media. Attivo a Roma dove attualmente tiene corsi di videomapping, esplora tutte le possibili interazioni fra musica video movimento e spazio, e viceversa. I was drawn to street arts through jugglery, doing fire performances. The interaction between the dance with fire and music let me to a reserch of instruments that come from different parts of the world, such as hangdrum, santoor, didjeridoo,wind instruments, arab and african percussion. Music is a universal language where there is no race, age or social class, and it is an instrument for encountering and unifing people. This leads me to an everlasting exploration with a growing interest for the healing power of music. At the fallowing link you can find some of the music I make. Do you like our project and you would you like to collaborate with us? “Metodo Harmony”and "healing Harmony Concert"
Religions are perfect for the ones who created them. The error is to think that they can work for the many, and it is absurd to expect acceptance from all. Rarely have religions existed as a healthy phenomenon. Only when Buddha, Christ or Kabir walked on Earth - otherwise religion is like a pathology, a disease. Those who reached realisation have a completely different understanding than from those who imitate - those that have no comprehension. The Truth can't be imitated and to achieve it you must walk into the unknown. You might get lost and never come back, you might loose any control of yourself or you might loose your mind, but when all limitation has been dissolved and each fibre of your being pulsates and vibrates, you become the ocean. You are lost in that orgasmic moment, the bright light of the divine, the satori, the samadhi, the nirvana, it is there that love comes to life. Visionary Art Community is introducing you a new journey in ancient and new shamanic rituals, with shamans and wizards... where there is no space for mind, there is only space for the soul. With seminars and workshops we will learn the secrets of those ones who have found their own rituals. Immerse in the best of psychedelic music, with international artists from instrumental techno to psychedelic rock, from psytrance to chill-out. Each artists will reveal to you their own vision of the universe, giving you the tools to explore and connect. Fire-eaters, body painters, acrobats, painters, actors, jugglers, musicians, sculptors, photographers, holistic artists, digital artists - all will take you on a journey where you are not a simple passenger, but a sentient cell of an immune system that will collaborate to heal this earth. Together we will forget about the social structures and systems we usually live in, that have ignored the importance of the sacred dimensions of life, abdicating decisions and faith to a "Money God" without soul. Together will forget the everyday language, and we will discover a universal language without words, without need of translation. A remembrance that will let us discover and recognise in our consciousness the archetype of Love. Waking up this knowledge already present in our soul, where the shape of 3 dances with the animals, where pure water will slide along the Crystal. The released energy will create a different reaction of love for colors, and immersing in the need to touch, knowing each other as the beings we are, beyond the masks we have worn. Accept yourself, respect yourself and Nature - follow her way, do not repress. Just stay open and enquiring, and remember doubt is a sign of intelligence - continue to seek your answers until you find them! All future participants are notified that immediate entry to the event will be guaranteed only to those who have already submitted the application for membership to the association through the online application. Anyone wishing to make a membership on the site will be faced with delays because the membership must be approved by the board of directors and this can not happen at the same time as membership for the relevant rules in force. The organization kindly asks all participants to take 5 minutes to apply for membership to have immediate access to the festival and to allow staff to comply with the rules. Once on site you will need to tell your name and surname, pay the associative contribution and withdraw your membership card.